Upon popular request, here are results from Labdoor's investigation of banned stimulants, authentic ingredients, and claimed benefits. 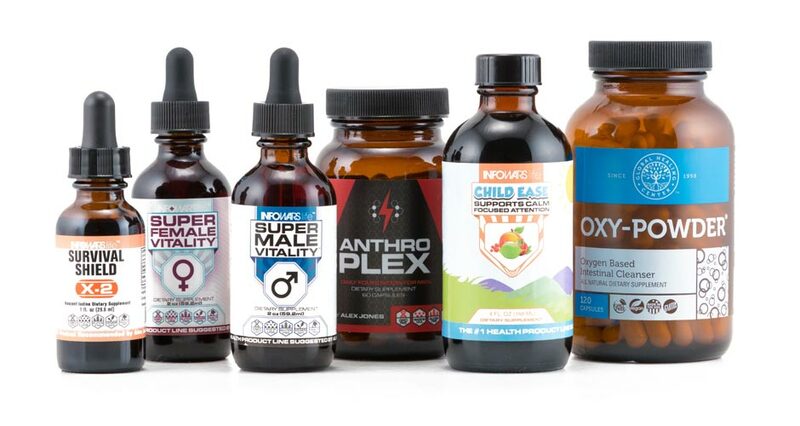 Due to high demand for testing from Labdoor's consumer audience and popular media outlets like Last Week Tonight with John Oliver and BuzzFeed, we took a subset of Alex Jones's Infowars supplements and brought them to the lab. Note: We tested all samples in triplicate, and wherever possible, cross-checked those results with at least two independent analytical laboratories. We tested all products for heavy metal contaminants including arsenic, cadmium, lead, and mercury. Child Ease, Super Female Vitality, Super Male Vitality, and Anthroplex were also screened using The World Anti-Doping Agency's (WADA) 2017 menu of more than 200+ substances banned from sport. These substances include steroids, stimulants, and abused drugs like ephedrine, diuretics, cocaine, oxycodone, and morphine. The 2 Vitality products and Anthroplex were also tested for sildenafil (brand name: Viagra) and similar compounds. The 2 Vitality products were also tested for caffeine. A few products claimed to have specialized ingredients. We tested these products to see if they actually had the more common forms of those ingredient. These included Oxy-Powder, which we tested for elemental magnesium and citric acid, Survival Shield, which we tested for iodine , sodium, and potassium, and Anthroplex, which we tested for elemental zinc. All products recorded levels of arsenic, cadmium, lead, and mercury below California Prop 65's established and proposed safe harbor levels. Safe harbor levels include Maximum Allowable Dose Levels for "chemicals listed as causing birth defects or other reproductive harm" and No Significant Risk Levels for "chemicals listed as causing cancer". Child Ease, Super Female Vitality, Super Male Vitality, and Anthroplex were tested for all substances listed in WADA's 2017 Prohibited List at a limit of detection of 10 ng/g and were found to be free of those substances. Lab results for Super Female Vitality, Super Male Vitality, and Anthroplex did not indicate any presence of Viagra (sildenafil) or related compounds (tadalafil, vardenafil, or avanafil). The Vitality products had undetectable levels of caffeine. Tribulus terrestris - Tribulus terrestris seems to increase libido in rats, and in one lone human study, improve erectile function, but this is at a dose of about 300 mg per serving. Ashwaganda - There's some evidence for ashwaganda being effective for reducing anxiety and fatigue, but only at about 400 mg per serving. Tongkat ali - There's possible evidence that this root might increase sperm concentration in men, but does little to increase testosterone. This effect has only been seen in limited research at about 300 mg.
Maca - There's limited evidence that maca root increases libido, but only at a very large dose of around 2500 mg per serving. Horny goat weed - In research, 80 mg/kg was found to increase testosterone and improve erectile dysfunction in rats. This equates to 6350 mg for a 175-lb person. This product measured 0.69 mg of zinc (31% below its claim of 1 mg). While zinc deficiency is relatively common - about 30% of people above the age of 2 in the U.S. are zinc-deficient - and zinc deficiency can cause impotency in males in very extreme cases, an adult male needs about 11 mg per day. The amount of zinc in this supplement is quite small, comparatively. The Anthroplex label also claims that the ingredients in this formula would work "synergistically with the powerful Super Male Vitality formula in order to help restore your masculine foundation and stimulate vitality with its own blend of unique ingredients". Our research shows no evidence of this potential. Synergy in science refers to the phenomenon where the combination of ingredients works better than the sum of its parts. 3 of the 5 ingredients in Anthroplex are already found in Super Male Vitality. The 4th herb, horny goat weed (also in Super Female Vitality) has not yet been found to be synergistic with any of the ingredients in either product. Moreover, Anthroplex claims 170 mcg of these 4 herbs combined, which, as we've discussed above is multitudes lower than any scientifically proven dosage for efficacy. Infowars claims that Child Ease "soothes the mind and bodies of children" from over-stimulation in a stressful world. Claims for calming children safely with this product are unproven. This product has issues similar to the previous mentioned products in that it lists some ingredients that could be credible and have beneficial effects except that it has so many ingredients, they wouldn't be effective in a 1.25 mL serving size. Conventional dosing of unstandardized herbs is often around 1 gram or more, which would exceed 1.25 mL even given conservative estimates. With essential oils like those in this product, manufacturers are recommended to standardize their concentrations, so accurate dosing is possible. Infowars, however, does not express concentrations or amounts of any of their herbal ingredients. For the essential oil in this product, on one extreme, it could be entirely innocuous with no active compounds. On the other, it could be so highly concentrated that it could cause stomach irritation and indigestion. This product measured 1830 mcg/serving of iodine, slightly below its claim of 1950 mcg/serving. We also tested this product on the chance that it might potassium iodide or sodium iodide, common formulations for iodine supplements used to treat thyroid disorders, which it wasn't. Survival Shield is just plain iodine, the same stuff doctor's used to pour on surfaces as a disinfectant. If your doctor told you that you really needed iodine, iodine and iodide forms work similarly well and are usually priced quite affordably. While iodine deficiency can lead to impaired thyroid health, hormonal imbalance, and metabolic disturbance, you should NOT take more iodine if you are already getting enough. In fact, excessive iodine can cause serious health problems - from nausea and vomiting to thyroid cancer and coma. To be safe, the American Thyroid Association warns consumers NOT to take more than 500 mcg/day of iodine unless instructed and monitored by qualified health professionals. Since The National Health and Nutrition Examination Surveys (NHANES) began in the 1970s, researchers have found that we generally get sufficient iodine from food sources alone. Samples came back with an average of 1497 mg/serving of elemental magnesium and 96 mg/serving of citric acid, meaning the product basically had the amount it claimed (1400 mg of elemental magnesium and 100 mg of natural citric acid). As we suspected, Oxy-Powder tested to be simply magnesium oxide and citric acid, which is actually fairly common in supplements and relatively cheap. When combined with water, magnesium oxide and citric acid form magnesium citrate, which acts as a laxative and causes watery diarrhea so stool can be emptied from the colon. In fact, the most efficient way to take magnesium citrate is in water, not as a pill like Oxy-Powder is formulated. Consumers should also be warned that generous use of this product, like any heavy dosage of magnesium oxide, can cause stomach irritation, nausea, vomiting, diarrhea, and electrolyte disturbances, which could amount to serious health issues if not normalized. The 6 products we tested are most likely free from spiked drugs and stimulants and are "clean" in terms of the heavy metal contaminants we tested for. However, the science behind many of their claimed ingredients are questionable. In some cases, the dosing would too low to be appropriately effective. In other cases, specialized forms of ingredients turned out to be simple, and relatively cheap formulations, albeit effective in certain cases. As always, we recommend you consult a licensed health professional when beginning any new supplement regimen and do your research as to what is really inside each product and whether it's right for your health. National Center for Health Statistics. (2017). National Health and Nutrition Examination Survey. Natural Medicines Complementary Database. (2017). NIH - Office of Dietary Supplements. (2016). Zinc Fact Sheet for Health Professional. NIH - U.S. National Library of Medicine. (2017). Sodium Picosulfate, Magnesium Oxide, and Anhydrous Citric Acid. OEHHA. (2013). Proposition 65 in Plain Language. USDA. (2016). Community Nutrition Mapping Project. World Anti-Doping Agency. (2017). 2017 List of Prohibited Substances and Methods.